Letv had recently announced the Le 1s Super phone that had some very interesting features along with the hardware at a very aggressive pricing. Following a week later we have some data from the brand that implies that they have had a great success with the launch. The device came with the USB Type-C Connectivity, fingerprint sensors, 3GB of RAM, 32GB Internal storage all packed under a 5.5″ Full HD display. It also came with a 3000 mAh battery, while priced at just 1099 Yuan (approx $173 / Rs. 11,200). Here is some information about the Le 1s announcement. The brand had set a target of a Billion Yuan for their 120″ 4K Le uMax120 Super TV that was also launched along-side the Super Phone, though they were able to achieve 50% of the same by selling a total of 1128 units that amounted to 500 million Yuan (US$79 million). These numbers are staggering considering that they were made by a new brand that has recently debuted into Smartphones & that’s one which is not heard by most of the consumers. Letv had entered the mobile phone business this year in the month of April while the TV business was launched 3 years back. In the month of September there was a report about LeTV Smartphones that had sold 587,000 units gaining a 5.8% market share in China. The brand does have a competitive advantage, while they had also announced at the recent presser that they would be actually selling their Le 1s devices at the loss & not make any profits from the devices. The 120″ plasma TV is the world’s largest smart TV, that when compared with the Samsung’s 110″ TV’s price of 1.25 million Yuan (US$197,145), Letv’s uMax120 sells for less than half the price, at 499,000 Yuan (US$78,700). 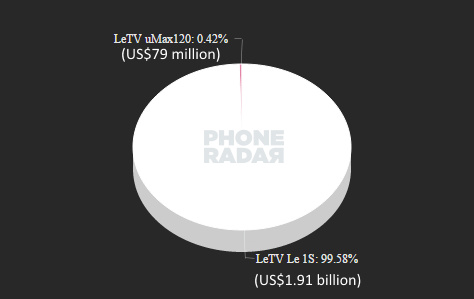 Letv announced that, following the launch of the Le Super TV and Le 1s super phone on October 27th, the organization has made over US$2 billion in the week following the launch event. Within seven days, the booking amount for the Le 1s Super phone has grown to more than 11 million units amounting to 12.1 billion Yuan (US$1.91 billion). And for the Le uMax120 Super TV, the world’s largest Smart TV, the booking amount within 48 hours reached 1128 units, amounting to more than 500 million Yuan (US$79 million). On the launch event, Mr. Jia Yueting, founder of Letv, announced that the sales target for uMax120 is 1 billion Yuan. However, the market reaction has outperformed expectations with sales of over 500 million Yuan in the 48 hours following the product’s launch. While initial market statistics show that the capacity in China for TVs over a 100 inches is only around 200 units, the uMax120 sales have exceeded the country’s market capacity. Among the 1128 preordered uMax120 customers, 10% are business clients, 65% are from apartment owners, while the remainder was pre-ordered by villa dwellers.